"The Unknown Maker" - a known, unknown. Let’s begin by turning the clock back to 2007 when a 1930 catalogue was found in the Rona Crystal archives in Lednicke Rovne, Slovakia, by the German glass researcher, Siegmar Geiselberger. The catalogue text is in German with Austrian characters, it features pressed glass and blown glass and several pages are missing. And there’s the tricky bit … right there … the missing pages! Because the most important page of all … the Front Cover … is not there. So, we have no maker’s name and no country of manufacture. Dang! 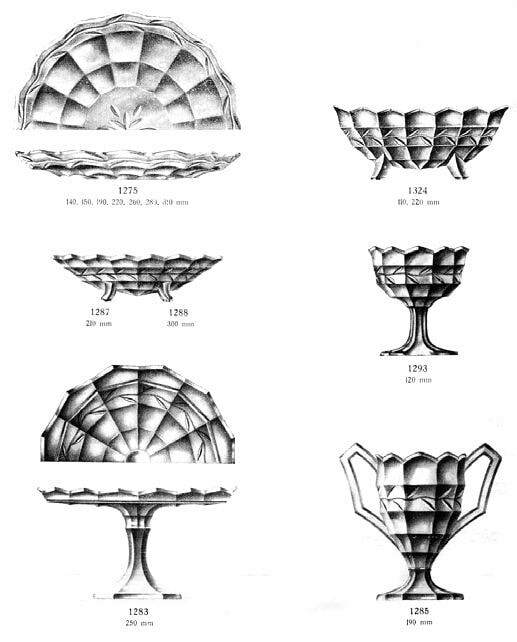 Immediately, we were able to state the country that the maker was located in: one of the pages in the catalogue showed a range of glass that we had a matching ad for - the "Balmoral Table Ware" range shown below. Our ad had the country of origin shown! Eureka, we were looking at Czechoslovakia. Unfortunately, the ad did not provide the name of the glassmaker, and hence we used the term "The Unknown Maker" in our subsequent research. ​Above: an extract from the 1930 catalogue of "The Unknown Maker". Right: an ad for the same glassware that was in a 1930 British Pottery Gazette and Glass Trade Review. ​The pattern shown in these two illustrations is Heavy Vine. Note that it was called Balmoral in the Pottery Gazette ad, and coupled with the ad’s design, it was clearly aimed at the British market by means of a Royal cachet: Balmoral is the British Monarchy’s Scottish residence, and its distinctive architectural shape is unmistakable (see right). ​An extremely important piece of evidence is that the ad stated that the glass was ‘Made in Czechoslovakia’ (see the detail below for clarity). The ad above shows the unmistakable appearance of Balmoral Castle, below (wikimedia). The intention was to seek "Royal" cachet for the glassware. ​​So who could that Czech glassmaker be? When we started to work in more detail on this predicament in 2013, we were only aware of two Czech glass makers that had produced a large amount of Carnival - Inwald and Rindskopf - plus a third, Libochovice, that had made a small amount. Close comparison of their known catalogues with the one from "The Unknown Maker" indicated that none of them were in the running. Who else might it be? In our 2008 Magic and Mystery 2nd edition, we put forward a view that it could be Schreiber, but our more recent investigations, ably assisted by Czech researcher Marcus Newhall, made us focus elsewhere. And when we discovered that the mystery catalogue had actually been found in an antique market in Czechoslovakia, our thoughts began to crystalise. Through Marcus, we had access to two catalogues: Sklarny Moravia (Moravian Glassworks National Corporation), Rosice u Brna, 1957 and Glassexport Czechoslovakia, Rosice u Brna, 1958 (thanks to Marcus Newhall and Radek Drnovský). Despite the complex names, both catalogues were from the glassworks known as Rosice (pronounced Roh-sitzer). And here’s the shocker - we saw many pieces in similar shapes and patterns in these Rosice catalogues that were also in “The Unknown Maker’s” catalogue. Could Rosice be our mystery maker, the producer of Heavy Vine, Double Tulip and more? The answer is … “very probably”. So let’s take a look at Rosice and learn something about this Czech glassworks. 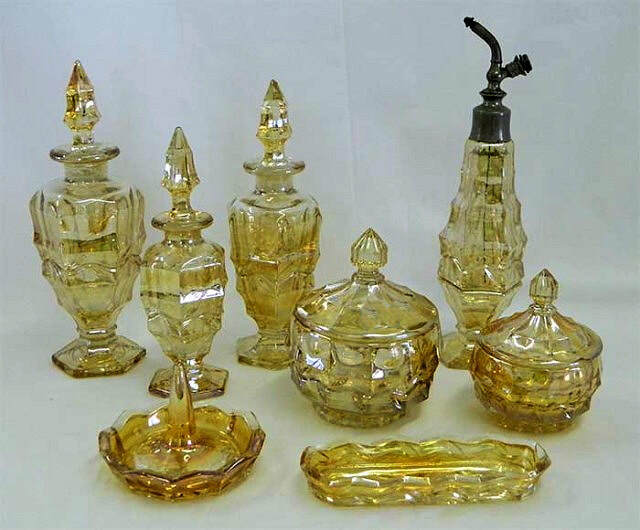 The Rosice glass factory began in 1920 but despite the foundation of a new stock company as well as having nearly eighty glass workers employed, production started but then stopped the following year in November, 1921. ​The Rosice glass factory, 1929. ​Courtesy of the Cultural Information Centre, Rosice. ​In early 1928 new life was breathed into the glassworks at Rosice by Vaclav Hrdina - an entrepreneur, who had an existing glass plant at Chlum u Trebone (previously the Stolze works). Things certainly changed under Hrdina. According to the Cultural Information Centre at Rosice, “new products for export to England, Italy and Switzerland were introduced. The glassworks reached the peak of its development in 1930. 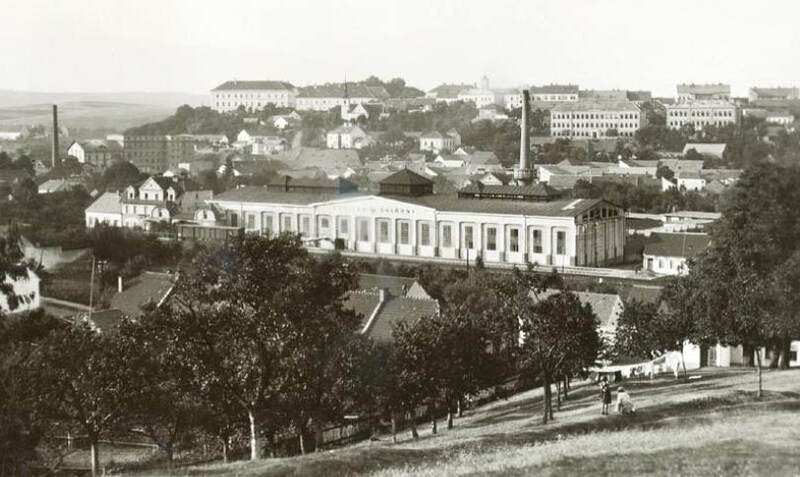 New offices, a display room, a gatehouse and freight tap line from Rosice railway station were built and the company had 200 employees.” Unfortunately for Rosice, Hrdina succumbed to the bad times on the stock market and at the end of 1931, Rosice closed down again. Fast forward to 1934 and another make-over took place at Rosice: first a co-operative ran it (and went bust) and then a new owner came along and invested in more pressed glass items. The export thrust continued, with the USA, Canada, Australia and Africa being added to the list of overseas markets. ​Glass production declined after 1938 and the war years were lean, but the factory survived and by the late 1940s was back up to its earlier production levels. ​In 1945 the company was nationalised later being incorporated into Sklo Union. It continued to make pressed glass (under Crystalex) until its closure in 1996. The site passed into the ownership of the Brno Municipality: classed as a “brownfield site” it then lay in a poor state of disuse until its sale (on the internet!) in October 2012. The picture above of the disused Rosice glassworks was taken in 2011 by Dendrofil (own work). Source: public domain, via Wikimedia Commons. All the evidence pointed toward Rosice being “The Unknown Maker” – especially the matching array of patterns in the 1930 mystery catalogue and the 1957 and 1958 Rosice catalogues. The time-line also fitted perfectly, as the 1930 date of the mystery catalogue was exactly when Rosice was fully developed, at full capacity, and pushing hard for exports. 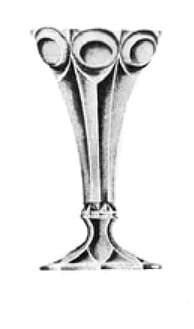 Furthermore, it is known that under Hrdina, Rosice made pressed glass, in particular vases, dresser sets, bowls and ashtrays - this is absolutely the correct “fit” for "The Unknown Maker". It is important to state clearly that the current evidence for Rosice is not 100% proof absolute. However, a great deal of it, as we have seen, points to Rosice being “The Unknown Maker”. Conversely and rather curiously, a lack of some very specific documentation also points to Rosice. There is no known, named catalogue for Rosice circa 1930. You’d expect that a company that was operating with 200 employees, was clearly geared up to export (especially to England), and with corresponding investment on major infrastructure including “new offices, a display room, a gatehouse and freight tap line from Rosice railway station” would require a comprehensive catalogue to display its wares. Yet (to date) no named catalogue is known with the name “Rosice” on the cover. It is our theory that the catalogue does indeed exist - and it is that 1930 catalogue that was found in the Czech market, with no cover and thus no maker’s name. We feel that the name on that front cover should read Rosice. Our suggestion is that “The Unknown Maker” might be referred to, in future, as “The Unknown Maker—Probably Rosice”. But note, the word “probably” is still a necessary adjunct until further proof is found and confirmation established. Here we present a selection of items from “The Unknown Maker” probably Rosice. The line illustrations are all from “The Unknown Maker” 1930 catalogue. Vining Leaf, known with frosted and un-frosted pattern bands. Two sizes known – 6 inch and approx 8½ inch. The small size with frosted band is illustrated (right). Fred decanter and stemmed wines. Photo courtesy the late Michael O’Brien. Heavy Vine - originally called "Lady". Dresser or Toilet set items in the Heavy Vine pattern. ​It was originally called Lady by “The Unknown Maker”. Photo, right, courtesy Seeck Auctions.